The Facing Project is a community storytelling project that connects people through stories to strengthen communities. Each project matches a community’s writers with individuals facing a certain topic, and the writer writes as if they are that individual, in the first person. If you’d like to be a part of this nationwide storytelling movement GO HERE. Within five minutes of meeting Carter, we knew he was a rockstar. 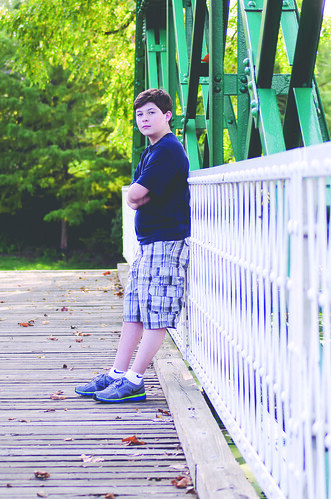 Carter was one of the storytellers for Muncie’s Facing Autism project. His story was one of the project’s most important. Carter is on the autism spectrum, and you might not expect him to highjack a photo shoot, but that’s exactly what he did. Our shoot for the project had just started and suddenly both of our photographers had been lured in by Carter’s Carter-ness and were off in the distance snapping photos of him… Carter on a bridge, Carter looking serious, Carter smiling, Carter beside a dumpster keeping it real. Carter being Carter. Stories reveal truths that can shatter preconceived notions and expectations. For us, Carter has smashed what we thought we knew about autism like a lead guitarist ending his show by swinging his stratocaster into the stage. Carter rocks and his story just keeps rolling on. Last week we heard from Carter’s Mom, Susie. She said that Carter was hoping to have his story highlighted as one of our featured stories of the week. Carter is proud of his story, as he should be, and so are many of his friends and family. Carter gave several of his teachers a copy of the book, and a couple of them asked him to sign their copy. The principal also heard about him being in the book and she wanted a copy. Carter seemed pretty excited that people were interested and he also gave the librarian a copy to “catalog” in the library. Several of his past teachers and school therapists (speech and OT) have also emailed me to say how proud of him they were, and that they could hear Carter’s voice in it. It has been a truly great experience for our whole family and I feel his story will continue to touch and educate people. That is a great feeling! Oh and he did have to sign copies for some of our family and friends. Thanks again for this experience. “They could hear Carter’s voice.” That’s exactly what a Facing Project story should do, and about the best compliment a writer can receive when writing from the point of view of someone else. Why do you want to write a story about me? Autism is not that big of a deal. I feel like I am inside a little white box writing all my thoughts and feelings with dry erase marker, but no one can find me to understand what I am going through. I erase those thoughts and feelings myself, but some things I write in permanent marker, and they will never be forgotten. If you could come inside, you would see the conversations I’ve had with you, the experiences I’ve shared, and the journey of my life; you would understand me. Carter let Jamie into his white box of thoughts and feelings, and Jamie showed the rest of us around. We are grateful to them both for sharing their gifts and stories with us. And personally, as a father of a two-year-old boy on the spectrum, Carter and his story fill my heart with hope and joy. But I cover what I do not want you to see. I put away what I do not want lost. I’ll tell you if you let me, though. They may not matter to you. But they matter to me. The secrets of my mind are my secrets and not for you to know. I don’t tell you because I don’t see you understanding anyway. You think you do, but you really don’t. It is hard for me to look you in the eye, even harder to be around you. Try learning when people talk so fast and think even quicker. You don’t have the patience to wait for my response. Instead, you avoid my words as if I should know to say what you want me to say. This overwhelms me. I’m going to open this white box for a moment. The first thing people notice about me is that I’m quiet. I’m quiet because I don’t know what to say. I see people in a group and I watch them talk to each other. Their lips move, laughter erupts, and their eyes brighten at the thought of the next word they are going to say. Instead of words coming to my mind to join their conversations, I watch them and think about their words. When they turn to me to join, my mind becomes blank. Everyone I know is an extrovert. I don’t know how I’m like other kids with autism. I wish I knew more about autism. I know that I am not like normal kids because I’m quiet. They can pedal a bike! They can lie. If you want me to lie, forget it. The main difference between me and normal kids is that they are outgoing—some are loud, but I ignore those kinds of kids. I love my mom, dad grandma, and grandpa, and my uncles. They are my favorite people. Being overwhelmed is the worst feeling ever. It makes my brain get dizzy and causes the noises to get louder. It gets on my nerves. Teachers could help by not overwhelming me. The perfect school would have three floors and a big pool. Teachers wouldn’t give a lot of homework; more importantly, they would get to the point. The only classes that would be at that school are Cooking and Science. Science is the best class. Well, the experiments with chemicals and animals are. The stupid work is my weakness. There was this boy who puked on the playground. Five of us were surrounding him and he puked. We picked on him. Well, I don’t know if we picked on him or bullied him. I hope he is okay. I feel bad, but I kind of don’t because he picked on me too. I bullied to survive. I have a village I created on Mine Craft. The hideout is Hatzan camp. The bandits lurk around in the corners. I’ve created secret rooms and passageways deep underground so they can’t find my treasures and livestock. The fort is called Alatak. It has an escape path. I’m building a new fort. I think I have a good shot at being a game designer when I grow up. Sure, I have to try harder to learn. Multiple choice tests are not clear. If my grades were based on homework, I’d probably get all A’s. My mom helps me through it, but she pushes me and makes me work hard. She always judges my writing. When I do my homework wrong, she is there to help me get it right. At least I am not confused about what she wants. Teachers, on the other hand, are not clear. I ask a question about the assignment and they answer me quickly and get back to being busy. Something a little weird about me is that I don’t go out a lot. It feels normal to be home. I don’t think anyone knows I have autism when they first meet me. If you try to have a conversation with me, you will realize I am quiet and think about things differently than you do. At night I curl up with my weighted blanket and bury my head to get comfy. What do you need to know about Autism? People shouldn’t talk like stories. Be more plain. Come out with it. Stop being confusing. Stimming helps me when I am overwhelmed. I tap the plastic hanger against my legs, arms, and sometimes my chin. I also hit it against the back of furniture, which has caused some damage to our couch. If I can’t use my hanger, then I walk and pace. You might find me gently tapping myself as if I had the hanger. I chew gum. When I get home though, I get my hanger. I do it when I want, but only at home. I love to be close to you. It makes me feel safe and to understand you better. I also like to be touched. I used to get my skin brushed, though not so much anymore. I still like it though. Don’t think I have forgotten something just because I don’t talk about it; I remember. I know what right and wrong is. I am like everyone else in that area. In reality, I’m better at it. If you’re autistic, you should get a stick or a hanger and try stimming. It will help you. All right, I think we’re done. I like being heard, but I feel overwhelmed. As told to Jamie Linton by Carter Tharp. Jamie Linton is a high school English teacher and mother of three by day, and a relentless idealist by night. A textbook introvert, she is self-motivated and driven. She lives in Muncie, Indiana, and is marrying the love of her life in June. Visit her blog at: www.truthorprayer.com. If you connected with Carter’s story, you can contact his mom, Susie Tharp, at dstharp72@yahoo.com.